London, 19 April, 2016 — The Philippine Embassy in London reported to the Department of Foreign Affairs that the British Library received today a set of cookbooks and commemorative stamps from descendants of Philippine food icon, Teresita “Mama Sita” Reyes. Mrs. Clara Lapus, President of Mama Sita Foundation, together with her daughter Joyce Lapus Sandoval and grandson Carlos Fidel Sandoval presented the donations to the British Library in London. The said donations were accepted on behalf of the Library by Dr. William Frame, Head of Modern Archives & Manuscripts, and Mr. Richard Morel, Curator of the Philatelic Collections, in the presence of Chargé d’Affaires Gilberto Asuque and other Philippine Embassy officials. The Foundation donated three sets of cookbooks filled with popular Filipino recipes to further promote Philippine cuisine globally, and to make Filipino cooking more accessible to the UK. It also donated three sets of Mama Sita’s commemorative stamps issued by the Philippine Postal Corporation (PHLPost) honoring the Philippine food icon’s contributions as maven historian and champion of culinary heritage. In accepting the donation, Dr Frame expressed appreciation to Mama Sita’s for the cookbooks and the commemorative stamps which are now part of the Library collections. Prior to the formal turnover of donations, the British Library curatorial team showed the Philippine delegation samples of their collections which included, among others, Noli Me Tangere, an 18th century English-Maguindanao vocabulary, old maps of Manila, rare postage stamps and banknotes. 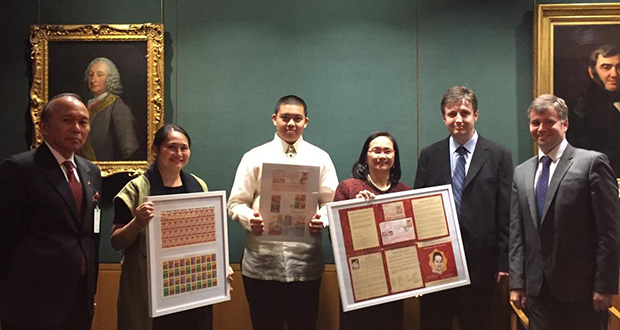 The donation to the British Library was initiated by the Mama Sita Foundation and the Philippine Embassy in London as part of the celebration of the 70th year of establishment of diplomatic relations between the Philippines and the UK.